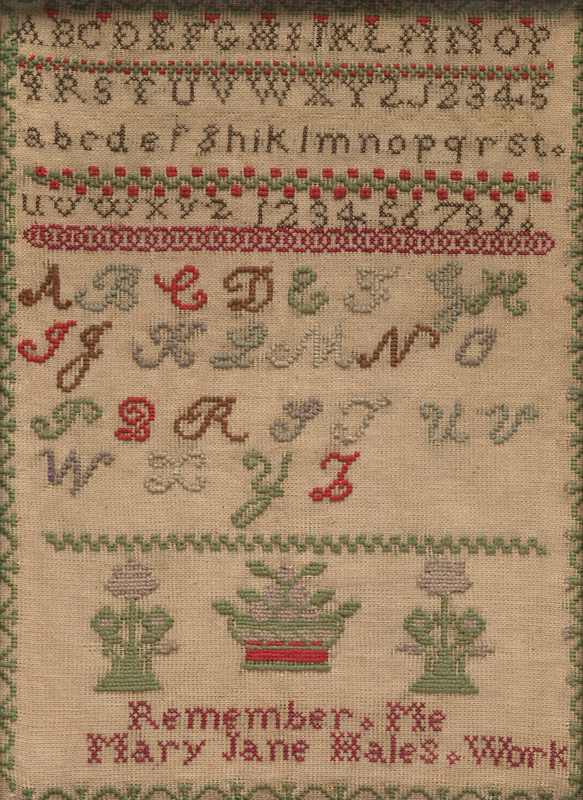 The DAR Museum’s sampler collection has expanded its range! When I became curator of needlework following the retirement of Olive Graffam just over a year ago, we had 76 New England works and 92 from the Mid-Atlantic states, but only twelve from the Midwest (mostly the Great Lakes states) and fifteen from Virginia and the rest of the Atlantic and Gulf Coast southern states. In the last decade, Olive had added several Midwestern and Southern pieces, which are more rare than Northeastern examples, where the schoolgirl sampler tradition flourished in the many day and boarding schools. Working with Olive, the California State Society purchased a California sampler for us in 2008, which was an exciting addition. California was being settled by Anglo-Americans during the decline of the sampler tradition, so this is a rare example. Our latest California sampler adds a new twist: it was made about 1810 by a Mexican Californian girl, when California was still part of Mexico. Its horizontal style and lack of letters in favor of samples of a variety of decorative needlework styles is typical of the Mexican tradition of sampler-making. The sampler had been glued to cardboard and is now at the conservator being gently un-stuck, cleaned, and given an archival mat. 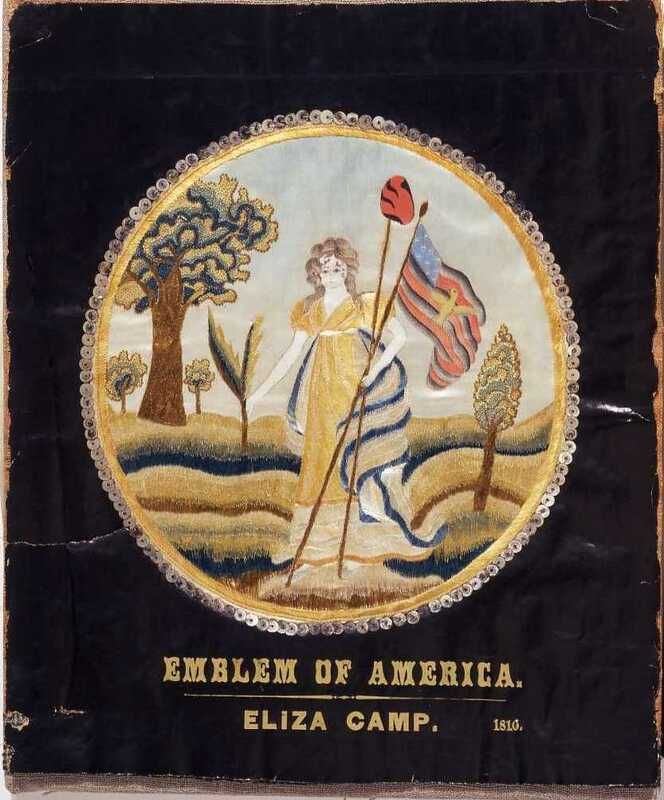 This silk mourning needlework picture from Wisconsin is possibly the only known silk needlework from Wisconsin. This needlework was done by Mary Hennessey of Waukesha, Wisconsin, in 1866, in memory of her father Richard. Most amazingly, instead of painting the mourners’ faces, it uses cut-out photographs! Note too, the exquisite detail and skill of the rendering of the folds of the fabric; and the use of crepe for a three-dimensional mourning veil. 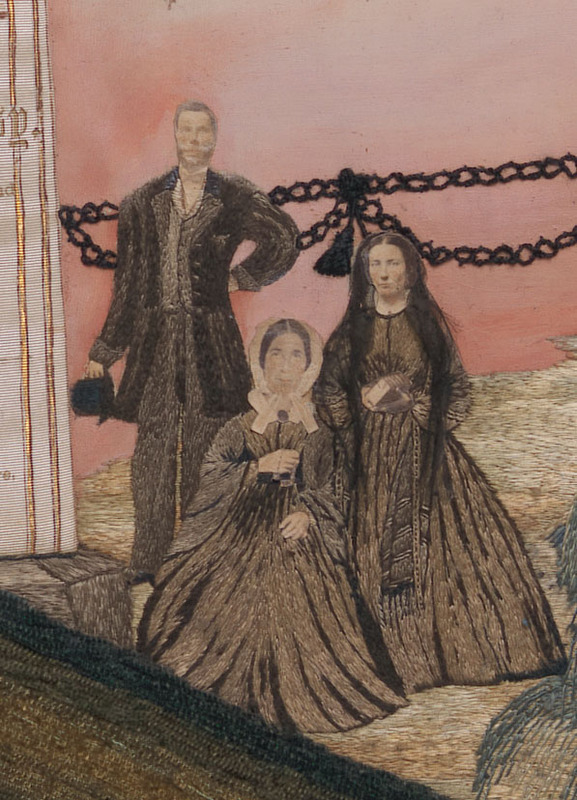 We believe the seated woman is Mary Hennessey’s mother, the widow, and that Mary placed herself beside her mother. The other figures are Mary’s brothers and sisters. 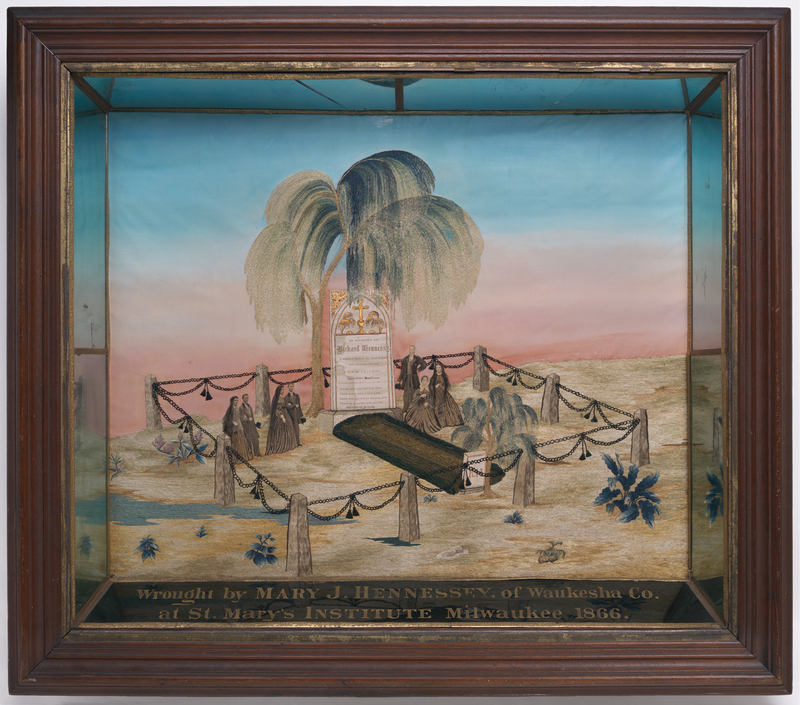 Mary, listed as a dressmaker in one census and as a teacher in another, was probably teaching needlework at St. Mary’s Institute, the school named in the painted inscription on the bottom of the shadow box frame. Possibly the most extraordinary purchase is of two related samplers from Hawaii. American missionaries arrived there in 1820. 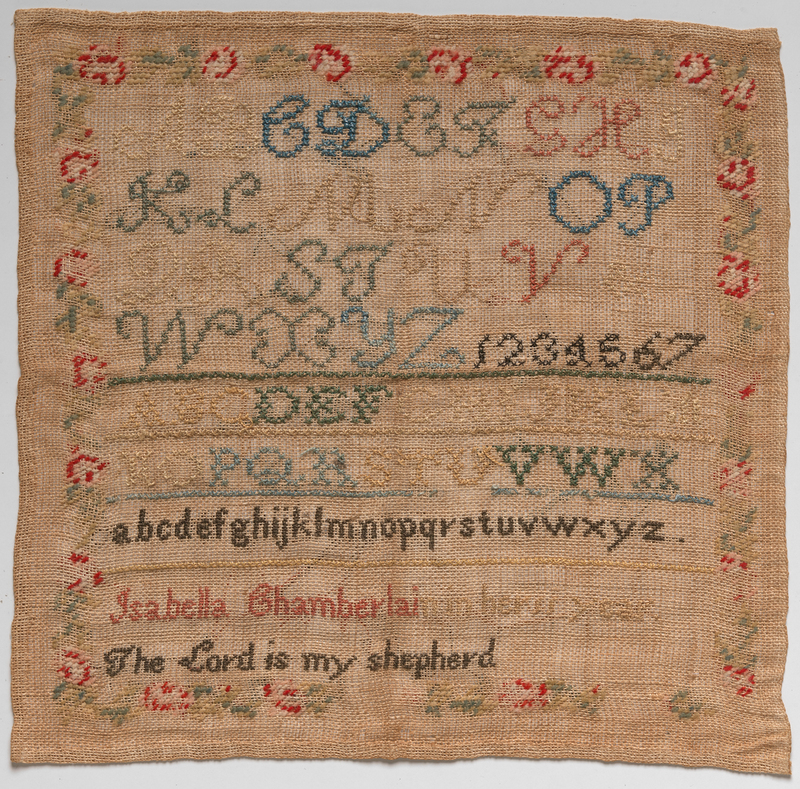 The Punahou School in Honolulu was founded in 1841 to teach the growing number of missionaries’ children; one of our samplers was made there by Isabella Chamberlain. Isabella’s father Levi came with the second group of missionaries in 1823 to be the secular administrator of the mission. Her mother, Maria Patton, married Levi shortly after her arrival on the third boat of missionaries in 1828. The Chamberlain’s Honolulu house is now part of the Hawaiian Mission Houses Historic Site and Archives, which tells the story of the missionaries and their work, and serves as a genealogical society for their descendants. Missionary schools were designed to both convert children to Christianity and indoctrinate them in Euro-American culture. 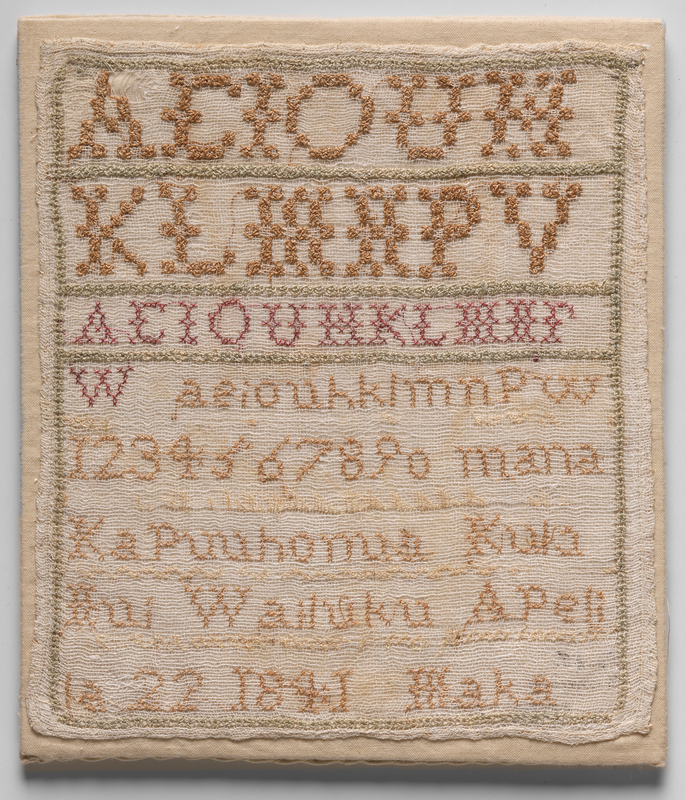 This sampler by “Maka” was made at the Wailuku Female Seminary on the island of Oahu under the direction of teacher Maria Ogden, who also gave instruction in spinning and weaving, quilting, and other textile arts. Ogden arrived on the same boat as Isabella’s mother, and the two were lifelong friends. Maka’s sampler uses only the letters of the Hawaiian alphabet (the missionaries created a written alphabet of the previously only oral language), and gives her name and date and a Hawaiian phrase which has been translated as “Wailuku, place of refuge.” We know nothing more of Maka; there are two girls in an 1841 list of students whose names could be shortened to Maka, one from near the school and one from another island, but we don’t know which girl made the sampler, nor what happened to them after their school years. Maka’s sampler is one of only three Hawaiian missionary samplers to survive (the other two are in the collection of Historic New England), and we are extremely happy to have this one here at the DAR Museum. The North Carolina Society funded the purchase of this rare North Carolina sampler in honor of former Curator General Rolfe Towle Teague. 1868 sampler by Mary Jane Hales, Gift of California State Society in honor of Linda Gist Calvin, President General, NSDAR, 2007-2010; Nancy B. Alexander, Vice President General, 2007-2010; and Anne D. Lampman, State Regent, California State Society DAR, 2006-2008. 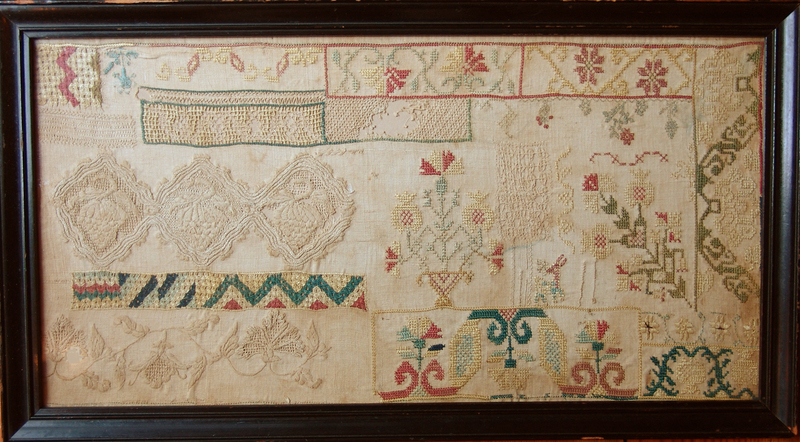 Isabella’s sampler of wool and silk on linen, made at age ten (“in her 11 year”) in 1848. Friends of the Museum Purchase. 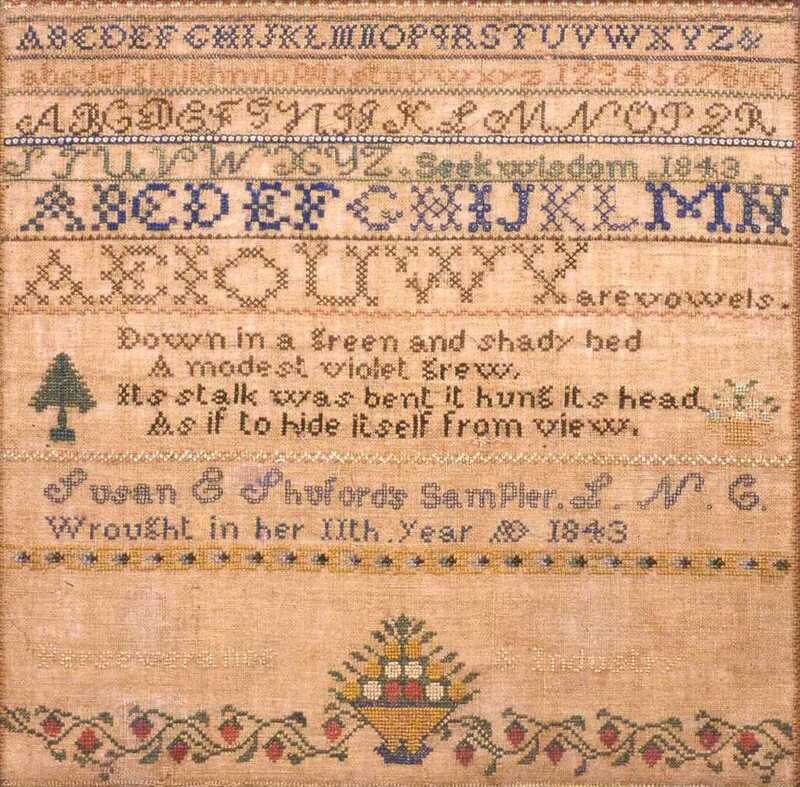 Maka’s sampler dated 1841. Friends of the Museum Purchase. If you would like to learn more, I will be giving a lecture at one of our DAR Museum Tuesday Talks, on April 10 at noon at DAR Headquarters, on the stories of the Hawaiian samplers, their makers, their schools, and the missionaries of Hawaii. If you can’t make it to Headquarters, the Museum lectures are posted online here: www.dar.org/MuseumVideos. You can also search the museum’s database for needleworks and samplers; we are constantly adding new entries for you to enjoy.